The Belgaum traffic police are spending about 50 lakhs in installing new speed breakers, roads signs, zebra crossings, glowing lights and many other equipment’s which will help the smooth flow of traffic. A few speed breakers were installed which are basically made of rubber and other materials at about 25 locations and we found out at two locations that the speed breakers literally BROKE in about 8 days time after installation. 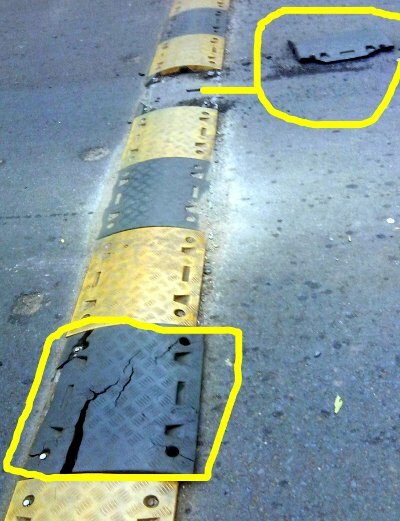 The speed breakers installed near the SP’s office in the photo just show the quality of the breakers or it might be that the flow of traffic on the said road is far too much than the speed breaker can take. A similar incident was reported from Goaves near Dutt mandir. Central Height: 10-12 cm; Shape: Parabola; Width: 3.5 metres; Length: same as road width. *Road humps should be painted in a ‘V’ shape and illuminated by solar cat’s eyes (solar cells embedded on pavements/road that reflect sun rays and glow in the dark) to make them visible. *The humps should not be more than five metres away from the junction or the intersection. Two signboards, one at 20 to 30 metres and another 10 metres away from the hump should be placed for the commuters to know about the road humps ahead. Intrusion of tree branches should be prevented. * Road humps should be put up only on the main roads and not on the cross roads. *In ‘rumble strips’, (humps that have around 5 to 10 strips together), the width of each strip is to be one foot and the gap between each strip, one foot. 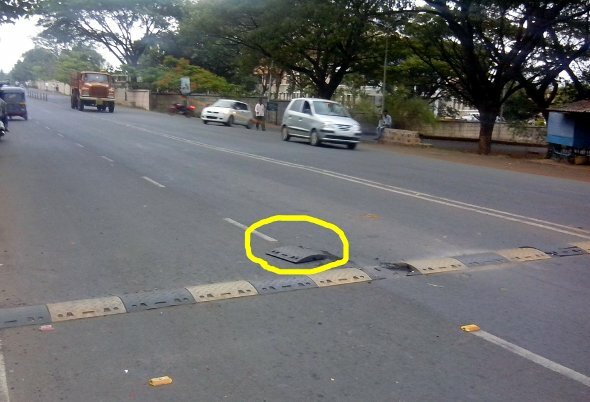 There are some speed breakers which are made without any knowledge like the ones on RPD college road, they are not speed breakers they need to be termed vehicles breakers. Recollect that a high ranked official some time ago got some irregular speed breakers and humps removed/demolished. There are may illegal ones in BELGAUM, that must be done away with… Once drove through RTO/Triveni junction through VEERBHADRA NAGAR to reach Main Double Road has more than a DOZEN speed breakers. The Belgaum Police has installed some on a few major roads. The national highway NH4 has new one’s cropping at every village till Dharwad. I dont think those speed brakers meet IRC standards. I think proper signals and traffic police men placed at necessary points would be a better option than these so called improper speed breaker of such quality as shown in photo on the roads. But who will listen to us and i really wonder who thinks of such stupid and unscientific speed breaker ideas.